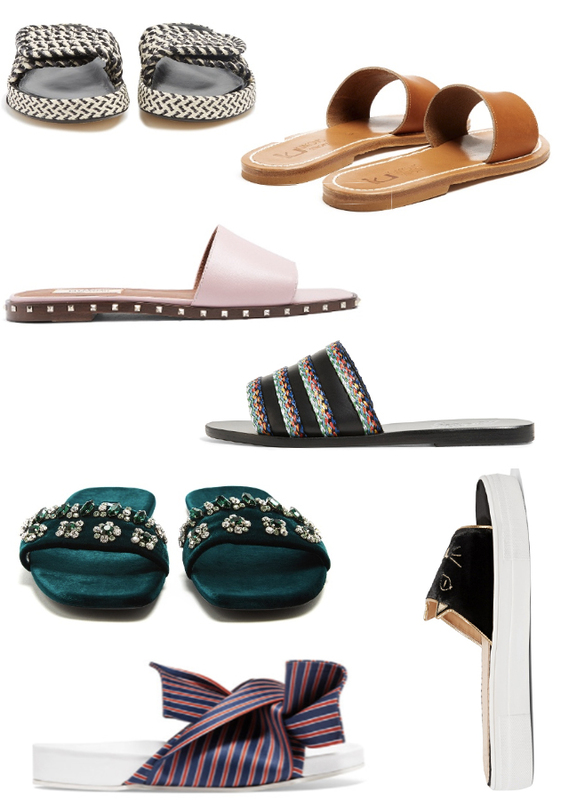 My edit of summer slides starting from just $24! If there’s one style of shoe you’re going to need over the next few months it’s the slide. Easy to pair with everything from jeans to shorts and dresses, it’s the versatile footwear staple that can easily update any look. And the range out there is seemingly endless! From super casual pool slides to glammed up styles with jewelled embellishments to fun patterns and bold colours, you’re bound to find a pair to suit your wardrobe. To help get you started here are slides starting from just $24! At first glance a pair of furry slides may not seem the most wearable of pieces but I can definitely vouch for the fact my Gucci Princetown slides get a constant workout in my wardrobe. So, what’s the key to making it work? When it comes to statement slides (furry or otherwise) I’d say the key to a flattering look is flashing a little ankle. For me, a winning combination is teaming them with black slouchy pants that are tapered at the ankle paired with a blazer or jacket or a pair of cropped jeans and a tee. If you’ve got a lot going on when it comes to your footwear keep the rest of your outfit quite pared back. If you’re wearing jewel encrusted statement slides then it’s probably not the best idea to then pair them with anything that’s quite loud or over the top as it can look a little overwhelming. Let the shoes do all the talking! A cropped or midi length is the most flattering length to pair with statement slides. It’s short enough to allow the shoes to take centre stage and sticks to the cardinal rule of showing a little ankle. I find a maxi length is a little bit too long as the slides end up getting lost amongst the fabric. Stick to a cropped length and you can’t go wrong.